Hey y’all – you know what this week has been great for? Good writing on the internet. I don’t know if it’s because I’m feeling vaguely on top of life (shhh, don’t tell anyone) so I’m more able to see the good stuff or whether the internet has just felt like throwing good stuff at me, but today I have some great links for you. Starting with some genius from Kerri Sackville. How frustrating is it that we’re able to see so it clearly when other people are kidding themselves … but we can’t do it for ourselves? Well Kerri has devised a cool trick to help with that! Are you like me and think “if someone doesn’t like me it’s just because they don’t know me well enough!”? Then you will really appreciate this insightful piece from Pip Lincolne. Confidence: it’s a tricky thing isn’t it? Sonia mentioned it in her Weekend Rewind post a couple of weeks ago and it’s something I’m always thinking about because it’s a trait I really want my kids to have. So I really loved The secret to being confident (without being arrogant). My main takeaways? The secret is vulnerability and the ability to celebrate the best of others without feeling diminished yourself. Finally … we’ve chatted here about Pete Evans before and I’d decided that I was the off the fence with regard to him once he decided to ‘go and release his Paleo Baby Cookbook anyway after his publisher dropped it amid concerns about babies dying from the ‘baby formula’ recipe in the book’. If you’re in the same boat as me (given the book has now been released) you might benefit from reading this from my good friend Alexx. 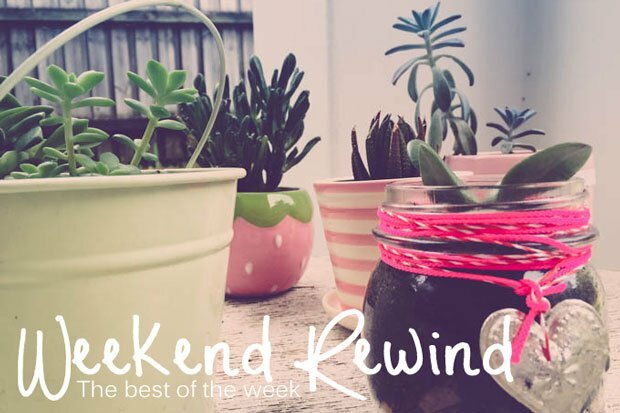 Hooray for Friday and Weekend Rewind time with Bron and Sonia. Meanwhile, this week’s super cool guest Rewinder is the very awesome Jen from Styling Curvy.